Sherrard Roe Voigt & Harbison is pleased to announce that the Tennessee Bar Association honored John Farringer with the President’s Award for his work on the issue of Medical Legal Partnerships (MLP). Mr. Farringer was honored with a number of other Tennessee lawyers during the Lawyers Luncheon at the TBA Annual Convention on June 19th in Memphis. The Firm congratulates Mr. Farringer on this honor. 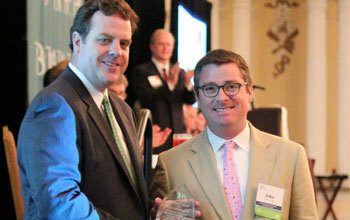 Photo: TBA President-elect Jason Long with Presidential Award winner John Farringer.